In a hilarious gag comic, stars its own creator as a talking wolfrabbit soon turned into a velociraptor that gets into a silly real-life antics and a little drama with his fellow animal cast that is comprised of real people he knows which can all be found in Ballerina Mafia. Immelmann, 27, came up with the idea for Ballerina Mafia (BM) when he realized he wanted something more comical and easier to spread around the internet compared to his first webcomic, Concession. “Concession had started as a light, humorous comic much like BM did, but by then, it had developed a really dark and serious plot,” said the 27-year-old. Ballerina Mafia launched on September 6, 2010 and its name is originated from a list of unrelated words and phrases meant to be catchy, nonsensical, and irrelevant to the comic. “Shugawar, [whose] name was a short-lived high school nickname mocking the band Gwar, made a demon panther character one night before BM was ever an idea. It was a late night of hanging out where he made the character as a parody of the idea of a ‘fursona’, thinking that being part demon would be pretentious and out of line. Little did he know that being half demon is remarkably tame by furry standards,” the BM creator shared. As readers follow Ballerina Mafia, they will notice the sudden change of Immelmann’s wolfrabbit character to a velociraptor. He says he needed a psychological push to motivate himself to get fit. “…so I created this larger-than-life dinosaur persona as motivation – a dominant, manly, athletic build to pretend I was. The idea was that I’d get so used to playing it that dieting and working out would become comfortable and second nature. And hey, it kinda worked! I managed to lose like 60 pounds in a year,” said Immelmann. 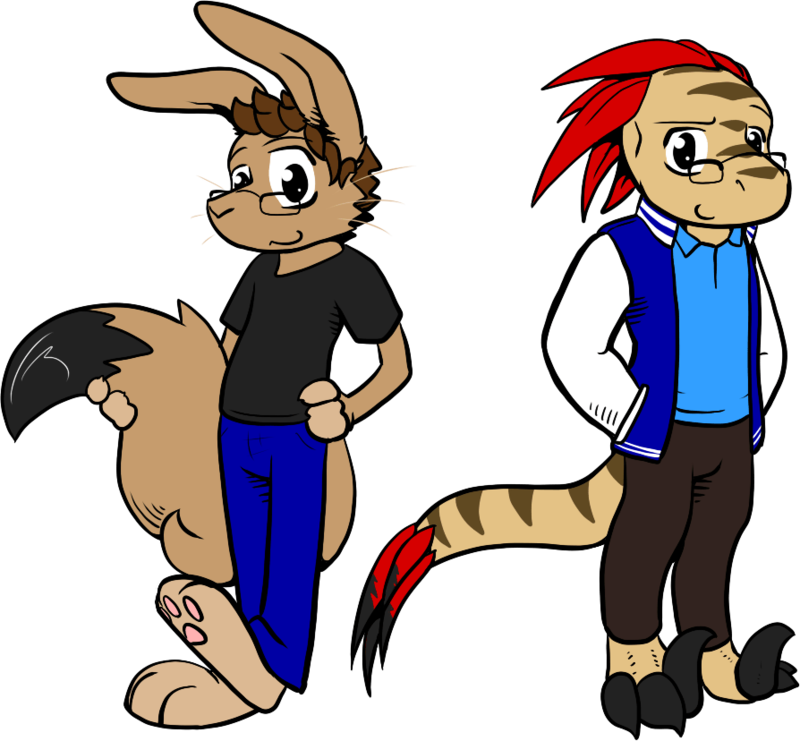 In the comic world, Immelmann’s Ballerina Mafia is labelled as a furry and according to WikiFur it is defined as follows: …fictional anthropomorphicanimal characters with human personalities and characteristics. Examples of anthropomorphic attributes include exhibiting human intelligence and facial expressions, the ability to speak, walking on two legs, and wearing clothing. The 27-year-old says he does not consider the term furry to be a genre and more of a style or a community. Ballerina Mafia’s staff comprises solely of Immelmann and he does everything from writing, illustrating, web design, and marketing. The artist says that for each strip of BM it starts as a vague idea that can be the core of the joke or even the basic theme of the strip. Then, it is written down usually in a big list of ideas in a notebook he keeps. He proceeds to sketch out panels on paper to figure out the flow and timing. “There’s almost never a script written out until the very end for these tiny gag strips,” said Immelmann. “It varies greatly, and as I usually work on it on Sundays after a late night of drinking, it can take considerably longer,” said the BM artist. Immelmann has attended several conventions that include four Anthrocons in a row, twice to FurFright and Midwest Furfest, and he hopes to attend another convention in Boston but says financial reasons have kept him away. Webcomics have become a popular medium to push artwork out to be recognized and because of that a lot of artists may find themselves up against competition and wonder if it worthwhile in the long run. Immelmann says that webcomics are traditionally given out for free and thus there is no real competition in the medium. “…anyone who does otherwise is kind of a jerk,” said the 27-year-old creator. He continues to say that there can be competition in regards to Patreon funding or store funds but people have the ability to read more than one comic at a time. “It’s not like albums or movies, which people will only buy so many of per year. It’s very much worth the time because, for me anyways, making webcomics was a way of cheating at having a social life. It got my art a ton of exposure that would otherwise be really hard to come by,” shared Immelmann. Immelmann’s dream for Ballerina Mafia was to get his webcomic onto television. “I thought it wasn’t 100% impossible to sell the modified ideas in cartoon form to, say, Adult Swim or something like that. I’ve basically lost interest in doing that by now, as all my love and attention has gone to my new webcomic, Order of the Black Dog,” he shared. According to Immelmann, Order of the Black Dog is “a more serious attempt at storytelling than Concession was. It’s split into many stories, but the core tale is about a couple of college-age girls who revive an ancient, secret organization to hunt down secrets and, in particular, unlock the mystery of a dangerous creature found in outer space.